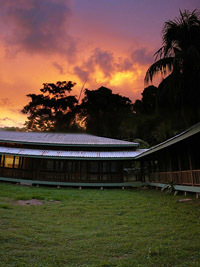 Location: on the Osa Peninsula, with entrances via the ranger stations at San Perillo in the northwest, La Leona in the southeast, and Los Patos in the northeast. Highlights: "the most biologically intense place on the planet" —National Geographic. 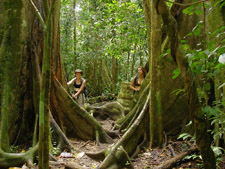 Primary tropical rain forest, mountain forest, cloud forest, alluvial plains, swamp, holillo forest, fresh water herbaceious swamp, mangrove swamp and rocky coastline! With approximately 124 species of mammals, 400 species of birds, 116 species of reptiles and anphibians, 66 freshwater fish species, 70 species of marine crabs, and that's just the beginning. Anteaters, river otter, ocelots, jaguars, peccaries, tapirs, squirrel monkeys... to name a few. Hiking, camping, amazing flora...breathtaking. Facilities: campgrounds at the the ranger stations and modest accommodations at the park headquarters in Sirena. Exotic. Lush. Experience nature at its best. Hiking is popular in the park and guided tours are available (and recommended). 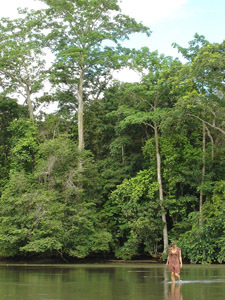 The sights, the sounds, the smells of Corcovado will stay with you your entire life. Pristine ecosystems in play reveal the secrets of nature. A must see for all those that travel to Costa Rica.